Newbold College har et studieprogram specielt fokuseret på mission og evangelisme. Det er for unge over 18 år, der har lyst til at ha et halvt år med undervisning på Newbold College, og et halvt år ude i ”feltet” i et missionsprogram. Prisen som står på plakaten er rabatteret af divisionen, og det skal næsten kun koste billetten over og lidt lommepenge. Henvend dig til ungdomsafdelingen om du har spørgsmål om programmet! Spred gerne de gode nyheder! The Year in Mission and Service programme is aimed at those who are eighteen and over and who are considering taking time-out to enrich the lives of others in mission and service. This Gap Year-style programme gives students the opportunity to discover more about themselves and people with whom they interact; fulfilling a passion for mission, service and volunteerism. This programme is for students who do not require a visa to study in the United Kingdom because the modules are not taken to gain and/or transfer credits. 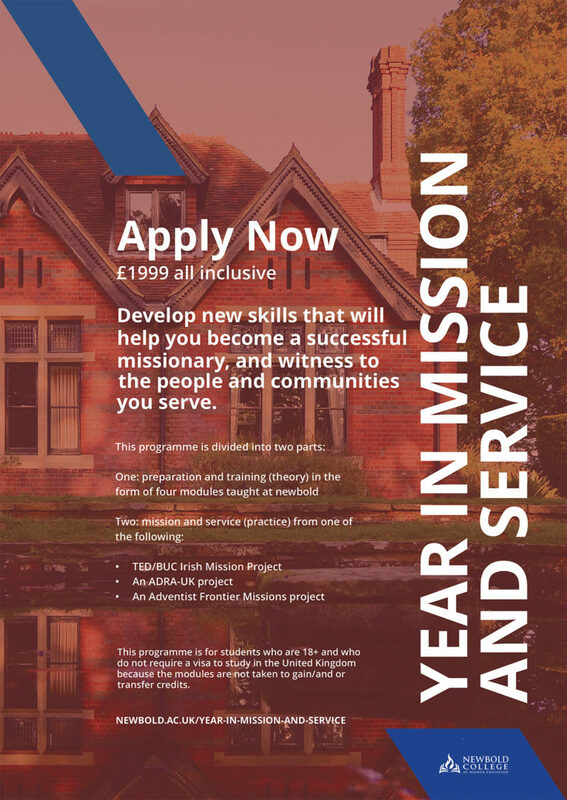 The Year in Mission and Service programme is divided into two parts: (1) preparation and training (theory) in the form of four modules taught at Newbold, followed by (2) mission and service (practice). Both parts are intentionally designed to offer students a chance to develop new skills that will help them become successful missionaries, and witnesses to the people and communities they serve. The following academic programme takes place in the first semester (September to December). Academic credits are not offered on this programme. 1. Mission and Volunteerism promotes personal development through understanding cultural diversity, and deepens spiritual insight and self-awareness with studies and altruism and compassion. 2. Ministry and Culture examines the principles of sociology and cultural anthropology, crosscultural communication, ministry in cultural diversity, and contemporary cultural issues. 3. Preparation for Mission Service introduces the fields of cultural anthropology and the sociology of religion, focusing on cross-cultural communication and contextualisation. 4. Cultural Anthropology introduces students to the basic theory, approaches and application of cultural anthropology and supports students to appreciate the complex nature of all cultures. The programme also offers two intensives and workshops on International Development and Urban Ministries and students will receive a series of free one-to-one personal life coaching sessions. Students will devote ten hours per week serving in various volunteerism opportunities such as local church ministries, campus ministries, and College sports ministries. All students are expected to participate in a real-life mission and service project (run by the TED and BUC, ADRA-UK, and AFM) as this is an integral part of this experiential learning programme – making the transition from theory to practice. An all-inclusive price of £1,999 covers tuition, room and board for the first semester. Fees must be paid, in full, on or before Enrolment Day on Monday 3 September 2018, together with a £200 room deposit, which is refundable at end of semester. Price includes shared accommodation with a shared bathroom and a meal package for the semester. For students applying from most European or European-style secondary school backgrounds and for students from a US or US-style high school background, please refer to the Newbold Handbook of Academic Programmes pages 198-199. Cambridge Certificate: First (FCE), Minimum score of 170. Time: January to August 2019. Practical involvement in a real mission and service project in order to make God known in different areas of the Irish Mission. Using your own gifts and ideas in collaboration with local Adventist congregations and pastors. The participant’s cost are travel ticket expenses to/from Ireland. 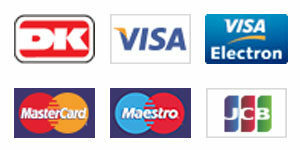 TED sponsorship for the first semester at Newbold College available for all who choose this practical track. Youth Outreach (Mission and Service): Foundations of youth outreach; Creative and innovative approaches; Social Media in mission; Compassion and community service; Health evangelism; Youth ministry as mission; Public evangelism and lay preaching etc. Youth Spirituality (Faith and Life): Biblical spirituality; Adventist identity; Responding to big life questions; How to understand and share Bible; Healthy church for healthy evangelism; Christian lifestyle and youth issues; Servant Leadership. Living in a Christian community involves more than just sharing a room or eating together. It involves getting to know each other better and developing a sense of belonging to the family. It gives you an opportunity to put in practice the biblical mandate of love – to pray for each other, to encourage one another, to serve and support each other. During this year, youth will have the opportunity to take part in corporate worships, in eating together, in classroom discussions, in joint daily activities, and in united service to other people. Everybody will strive to develop the best possible relationships with other members of the team. Our vision is to follow Jesus as our best example of service. Ellen G. White wrote: „The Saviour mingled with men as one who desired their good. He showed His sympathy for them, ministered to their needs, and won their confidence. Then He bade them, “Follow Me.”“ (Ministry of Healing, 143). In the same way, the youth will try to connect to the people in the local community and gradually develop true friendships with them. The next step is to serve their needs motivated by empathy and in that way to win their confidence. Finally, out of love for them we want to invite them to follow Jesus, because this is their greatest need. During our mission activities we will take into consideration gifts, interests and ideas of all youth and encourage team-work with each other and with local churches. Through all our activities and by our presence we aim to preach the hope that is in Jesus and to serve people in their holistic needs. Beside involving the youth in action, every aspect of the project is intended to foster the spiritual growth and help the youth to develop as complete persons equipped for mission and service. Daily timetable will ensure that the best time is spent in a personal prayer and Bible study. Individual coaching sessions with mentors will give opportunity for everybody to be heard, supported and encouraged in their relationship with Jesus. Every member of the team will be stirred not only to develop deeper relationship with Jesus, but also to grow personally and professionally, which includes working habits, reliability, perseverance and team skills. Beside practial work, the empasis is on high-quality education. The youth will have a wonderful opportunity to experiance the best what Adventist education can offer in Europe as well as continual training throughout the year done by best practioners.